Pauline Nesbitt, born Jane Slovensky in 1905, was raised on a Wisconsin farm where she first fell in love with horses. She began her rodeo career at age 17 as a bronc rider, but after seeing Tad Lucas perform in San Antonio, she made the switch and added trick rider to her list of abilities. 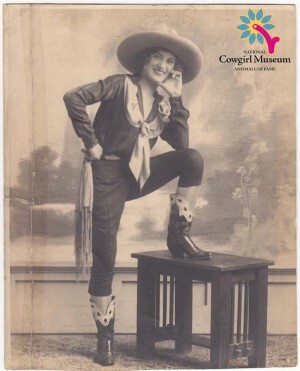 Pauline had a successful career; she was a regular working for Gene Autry at Madison Square Garden and Boston Garden, and competed at Cheyenne, Fort Worth, Kerrville, Tulsa, and Denver. In 1938 Nesbitt won World Champion Trick and Fancy Rider. Nesbitt made all of her own costumes and took up modeling. She, along with Tad Lucas, Polly Mills, and Iva Del Draksler modeled in western clothing for the 1941 Sears and Roebuck catalog. Pauline bought a small ranch where she lived, ran cattle, and continued ranching until the 1980’s.